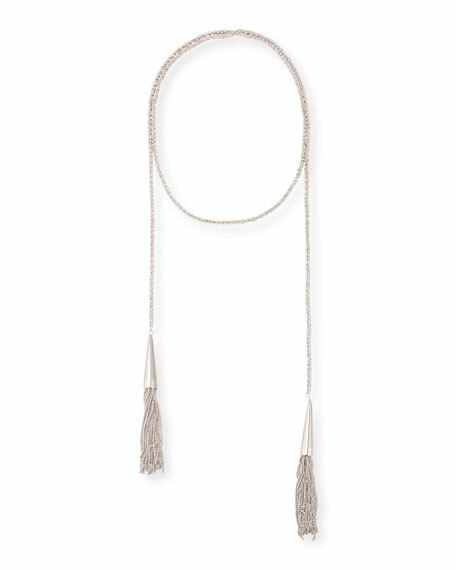 This Kendra Scott Phara necklace adds a dose of Deco with a dripping chain and swingy tassels. Ample length offers many ways to drape, wrap, and knot. Kendra Scott Gage Crystal Oval Link Necklace, 36"
EXCLUSIVELY AT NEIMAN MARCUS Gage necklace by Kendra Scott. Your choice of metal plating. 14-karat gold plated brass. Rhodium-plated brass. 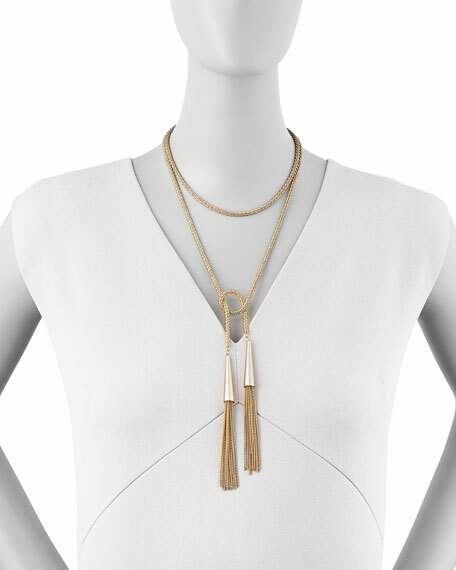 EXCLUSIVELY AT NEIMAN MARCUS Gage necklace by Kendra Scott. Your choice of metal plating. 14-karat gold plated brass. Rhodium-plated brass. Mixed glass stones. Lobster clasp. Approx. 36"L. Please note: Due to the one-of-a-kind nature of the medium, exact color patterns may vary slightly from the image shown.